North Shore patients requiring spine surgery or back pain surgery will find world-class care at North Shore Medical Center (NSMC). A member of Partners HealthCare, NSMC is the largest provider in the region, with multiple hospitals and urgent care clinics as well as doctors’ offices throughout the area. NSMC neurosurgery physicians perform a broad range of spine surgery procedures, including minimally invasive and complex surgery for adult patients. Our spine specialists work closely with patients and collaborate with other neurological specialists to craft treatment plans that are tailored for the specific situation of each patient. Consultation with a back and spine specialist is available through two practices located in Peabody, MA. 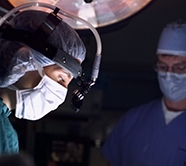 Learn more about neurosurgery at NSMC. Spine surgery procedures performed by NSMC specialists. Spinal stenosis treatment, which involves inserting a device into the back to help with the pain of spinal stenosis. Microsurgical decompression, where a portion of the laminar roof over the spinal canal is removed to relieve pinched or compressed nerves. Microdiscectomy surgery to remove a portion of a herniated lumbar disc to relieve pressure on a spinal nerve. We also offer spine surgery and nonsurgical alternatives for sports-related injuries and conditions. Our spine surgery specialists provide surgical and nonsurgical care to help restore function, reduce discomfort and prevent further injury. Alternatives to spine surgery may include education, physical therapy, aquatic therapy, ultrasounds, spinal injections, medication, and exercise. Our comprehensive medical and surgical care offering includes cardiac ablation surgery, treatment for hyperhidrosis, digital breast tomosynthesis and much more. Patients considering spine surgery can use the Find a Doctor search on our website to find a spine surgery specialist.